Flexible robotic cells are used in many real-life industries to produce standardized items at a high production speed. Determining the schedules of these cells is an important optimization problem in those industries. In this study, the cell's machines are identical and parallel. In the cell, there is an input and an output buffer wherein items being processed and the finished items are kept, respectively. There is a robot performing the loading/unloading operations of the machines and transporting the items. The system repeats a cycle in its run. Each machine processes one part in each cycle. The cycle time depends on the order of the loading/unloading activities. Therefore, determining the order of these activities for the minimum cycle time is needed. We propose a new mathematical model to solve the problem. For large size problems, three metaheuristic algorithms based on local search algorithm are proposed. In the metaheuristics, in order to compute the minimum cycle time of a given solution a linear programming model is needed to be solved which is one of the recent cases in the literature to the best of our knowledge. Several numerical examples are solved by the proposed algorithms and their performance and solutions are compared. Abdekhodaee, A. H., Wirth, A., & Gan, H. S. (2004). Equal processing and equal setup time cases of scheduling parallel machines with a single server. Computers & Operations Research, 31(11), 1867-1889. Brauner, N., & Finke, G. (2001). Cycles and permutations in robotic cells. Mathematical and Computer Modelling, 34(5-6), 565-591. Crama, Y. (1997). Combinatorial optimization models for production scheduling in automated manufacturing systems. European Journal of Operational Research, 99, 136-153. Crama, Y., & Van de Klundert, J. (1999). Cyclic scheduling in 3‐machine robotic flow shops. Journal of Scheduling, 2(1), 35-54. Caramia, M., & Mari, R. (2017). A manufacturing cell formation problem with a maximum cell workload constraint. IMA Journal of Management Mathematics, 28(2), 279-298. Dawande, M., Geismar, H. N., Sethi, S. P., & Sriskandarajah, C. (2005). Sequencing and scheduling in robotic cells: Recent developments. Journal of Scheduling, 8(5), 387-426. Foumani, M., & Jenab, K. (2012). Cycle time analysis in reentrant robotic cells with swap ability. International Journal of Production Research, 50(22), 6372-6387. Foumani, M., & Jenab, K. (2013). Analysis of flexible robotic cells with improved pure cycle. International Journal of Computer Integrated Manufacturing, 26(3), 201-215. Ghadiri Nejad, M., & Banar, M. (2018). Emergency response time minimization by incorporating ground and aerial transportation. Annals of Optimization Theory and Practice, 1(1), 43-57. Ghadiri Nejad, M., Güden, H., Vizvári, B., & Vatankhah Barenji, R. (2018). A mathematical model and simulated annealing algorithm for solving the cyclic scheduling problem of a flexible robotic cell. Advances in Mechanical Engineering, 10(1) 1-12. Ghadirinejad, M., & Mosallaeipour, S. (2013). A new approach to optimize a flexible manufacturing cell. In 1st international conference on new directions in business, management, finance and economics (Vol. 38). Gultekin, H., Akturk, M. S., & Karasan, O. E. (2008). Scheduling in robotic cells: process flexibility and cell layout. International Journal of Production Research, 46(8), 2105-2121. Gultekin, H., Karasan, O. E., & Akturk, M. S. (2009). Pure cycles in flexible robotic cells. Computers & Operations Research, 36(2), 329-343. Jiang, Y., Zhang, Q., Hu, J., Dong, J., & Ji, M. (2015). Single-server parallel-machine scheduling with loading and unloading times. 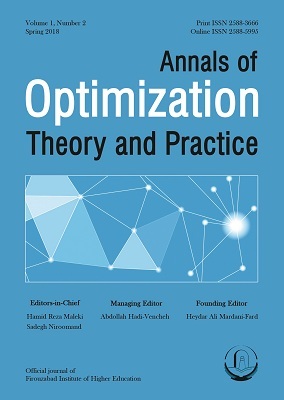 Journal of Combinatorial Optimization, 30(2), 201-213. Jolai, F., Foumani, M., Tavakoli-Moghadam, R., & Fattahi, P. (2012). Cyclic scheduling of a robotic flexible cell with load lock and swap. Journal of Intelligent Manufacturing, 23(5), 1885-1891. Kim, H., Kim, H. J., Lee, J. H., & Lee, T. E. (2013). Scheduling dual-armed cluster tools with cleaning processes. International Journal of Production Research, 51(12), 3671-3687. Mjirda, A., Jarboui, B., Mladenović, J., Wilbaut, C., & Hanafi, S. (2014). A general variable neighbourhood search for the multi-product inventory routing problem. IMA Journal of Management Mathematics, 27(1), 39-54. Mosallaeipour, S., Nazerian, R., & Ghadirinejad, M. (2018a). A Two-Phase Optimization Approach for Reducing the Size of the Cutting Problem in the Box-Production Industry: A Case Study. In Industrial Engineering in the Industry 4.0 Era (pp. 63-81). Springer, Cham. Mosallaeipour, S., Nejad, M. G., Shavarani, S. M., & Nazerian, R. (2018b). Mobile robot scheduling for cycle time optimization in flow-shop cells, a case study. Production Engineering, 12(1), 83-94. Nejad, M. G., Kashan, A. H., & Shavarani, S. M. (2018a). A novel competitive hybrid approach based on grouping evolution strategy algorithm for solving U-shaped assembly line balancing problems. Production Engineering, 1-12. Nejad, M. G., Kovács, G., Vizvári, B., & Barenji, R. V. (2018b). An optimization model for cyclic scheduling problem in flexible robotic cells. The International Journal of Advanced Manufacturing Technology, 95(9-12), 3863-3873. Nejad, M. G., Shavarani, S. M., Vizvári, B., & Barenji, R. V. (2018c). Trade-off between process scheduling and production cost in cyclic flexible robotic cells. The International Journal of Advanced Manufacturing Technology, 96(1-4), 1081-1091. Ribeiro, C. C., & Resende, M. G. (2012). Path-relinking intensification methods for stochastic local search algorithms. Journal of heuristics, 18(2), 193-214. Sethi, S. P., Sriskandarajah, C., Sorger, G., Blazewicz, J., & Kubiak, W. (1992). Sequencing of parts and robot moves in a robotic cell. International Journal of Flexible Manufacturing Systems, 4(3-4), 331-358. Sevkli, M., & Aydin, M. E. (2007). Parallel variable neighbourhood search algorithms for job shop scheduling problems. IMA Journal of Management Mathematics, 18(2), 117-133. Shavarani, S. M., Nejad, M. G., Rismanchian, F., & Izbirak, G. (2018). Application of hierarchical facility location problem for optimization of a drone delivery system: a case study of Amazon prime air in the city of San Francisco. The International Journal of Advanced Manufacturing Technology, 95(9-12), 3141-3153. Vatankhah Barenji, R., Ghadiri Nejad, M., & Asghari, I. (2018). Optimally sized design of a wind/photovoltaic/fuel cell off-grid hybrid energy system by modified-gray wolf optimization algorithm. Energy & Environment, 0958305X18768130.